A lot of things are annoying: Long meetings, traffic jams, tax forms. And fire drills. The truth is one can’t ignore annoying things because the consequences are usually catastrophic. In the case of fire drills and fire safety, this is exceptionally true. Because we are safety oriented, fire isn’t an everyday threat. We’ve built our infrastructure and environments so that we can have some peace of mind. This also becomes the problem. In office buildings and plants, it is essential to have open exits, and essential that people know where they are. One oft-cited case from 1991 tells a tragic story of locked doors, obstructed exits and no fire plan. The case involved a food products company. Oil from a hydraulic line leaked out a few feet from a naturalgas fired cooker. The blaze blew up instantly, trapping workers who couldn’t get out locked or obstructed doors. No fire suppression system was in place and exits were far from work stations. Out of 90 employees, 25 died and an additional 54 were injured, according to OSHA. While this was an exceptionally tragic case, blocked exits and locked doors are possible to find in any location. 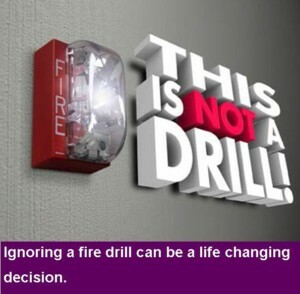 Usually, these situations are easy to remedy and all it takes is a fire-safety attitude. In fact, the threat of fire is highest during working hours. According to FEMA, non-residential building fires occur most frequently from 3 p.m. to 6 p.m.
An estimated 86,500 nonresidential building fires are reported to United States fire departments each year, according to FEMA. These fires cause an estimated 85 deaths, 1,325 injuries, and $2.6 billion in property losses per year. In workplace cases where the blaze is not contained, the most common areas for fires to occur is in vehicle storage areas or other storage areas. Electrical malfunctions and cooking areas follow closely as areas of ignition. Regardless of where a fire starts, the key is knowing how to escape a building. 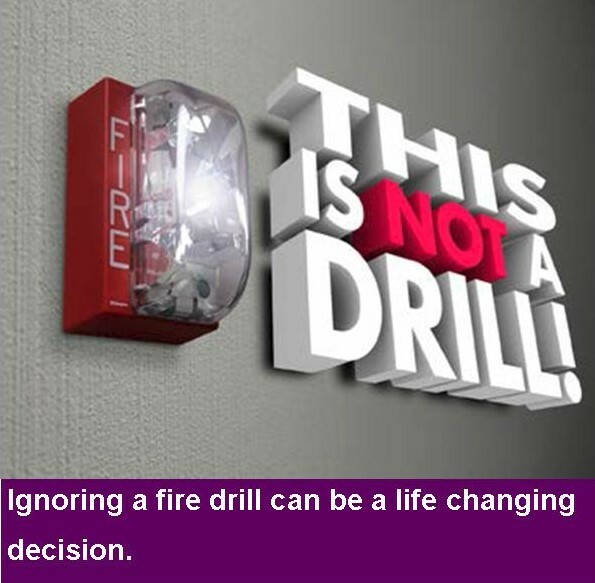 Don’t ignore the occasional, and annoying, fire drill. The consequences can be catastrophic.